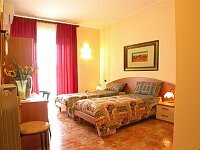 In Lecce, only a few yards from the historical centre, Raffaele and Barbara reserve for their guests the warmest of welcomes and a comfortable stay. In a strategic position, chosen for all your holiday requirements, the B&B is ideally placed to reach all of the most interesting attractions of the city. The historic centre - only 300m from the gateway to the historic centre "Porta San Biagio", within which one cannot anymore use the car. The central railway station - only 350m ( ideal for those arriving by train ). The campus of the University of Lecce - Palazzo Principe Umberto - 100m. The "Sigismondo Castromediano museum" - 100m. The majestic and historic "Politeama Greco theatre" - 800m. and moreover, thanks to the nearby bus stop underneath the B&B. EASILY ACCESSIBLE : Just outside the walls of the pedestrian historic centre, the B&B is accessible for those who arrive in car without any problems of parking or of access which one encounters within the walls of the historic centre. It is also extremely easy, from the B&B, to reach all of the major roads which lead to the most beautiful costal resorts ( Otranto, Gallipoli, Torre dell'Orso, Santa Maria di Leuca). The historic centre of Lecce, indicated with the yellow background, is completely pedestrianised and therefore it is forbidden for non residents to access it by car. 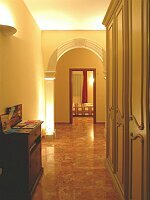 Our B&B is 400m from the principal entrance of the historic city centre ( Porta San Biagio ), travelling along Viale lo Re, if one leaves Porta San Biagio on the left and follows Viale lo Re for another 400m, one will find themselves opposite Castello Carlo V, adjacent to Teatro Politeama Greco and opposite the splendid Piazza S. Oronzo. From the principal entrance to the city (Superstrada Brindisi - Lecce), turn right at the second roundabout for Via F. Calasso e viale dell'Universita' until you reach Porta Rudiae, then turn left for Viale Gallipoli. At the second traffic lights, follow straight ahead for Viale Marche (leaving the police station on your left). We are right at the top of Viale Marche to the left, underneath the arcade (100m). You will find us at number 11/f. Bus 24, 25 for the hospital "Vito Fazzi" of Lecce, and the "Hotel President".